Have you been wondering how you can start trading Crypto currency especially Bitcoin which happen to be the most popular? Worry no more as this post is a sure beginners guide that will expose the little secrets in trading cryptos. This post will also reveal the best crypto currency trading platforms. But wait! What is CRYPTO CURRENCY? Crypto currencies are digital currencies which are used as a medium of exchange, created and stored electronically in a blockchain! The Crypto market is decentralized, with no government or bank involved. This ensures privacy of transaction and elimination of transaction charges. Do you know trading of digital currencies aka crypto currencies are the latest massive online investment? Why? Because crypto currencies are not regulated by any government or organisation. There is no call for devaluation or floating of the currency. Because Digital currencies are not regulated makes it more appealing to invest in. But do note that may change, given a recent call for regulating this segment. Though it is a big hit with investors, especially because of the record run of Bitcoin, the most popular of all the digital currencies, there have been skeptics crying foul over the legitimacy of this investment class. In simple terms, block is like a page of a record or ledger. Blocks are files where data concerning a digital currency network is stored permanently. It is the list of all transactions in a peer-to-peer network. Mining is a computationally-intensive process the computers or nodes in a cryptocurrency network complete to verify the transaction record. In return, miners receive digital coins as compensation. Computer system used for mining cyrptocurrencies. Any computer that connects to a blockchain is called a node. 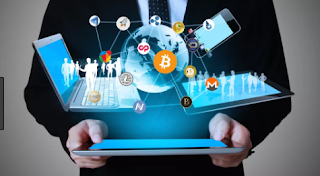 These are websites where cryptocurrencies can be bought or sold, or in other words, exchanged in return for other digital currencies or traditional currencies. Initial Coin Offering, or ICO, is selling a new digital currency or token at a discount by a company to raise money. It is the means by which a new cryptocurrency venture raises funds. A software program used to store private and public keys which are used to send and receive digital currencies and monitor their balance by interfacing with various blockchains. Th easiest way to trade Bitcoin or Cryptos in Nigeria is through the purchase of giftcards. Yes, purchase gift cards and exchange them for Bitcoin or any other crypto especially if you are in nigeria. If you have ways to buy gift cards at cheaper prices then you should hurriedly go to www.paxful.com to start exchanging your gift cards for Bitcoin. Staggering returns. Going by the breathtaking rally in Bitcoin, you have the potential to get rich investing in digital currencies. From $968.23 at the end of last year, Bitcoin has rallied over 740 percent and has recently scaled the $8,000 barrier. The potential presented by the cryptocurrency as a preferred medium of savings, especially as fiat currencies, are exposed to geopolitical, economic and financial uncertainties and makes it a preferred investment choice. Not the best bet for investors seeking fixed returns, as an investor in the digital currency is not entitled to dividend income. It’s possible to lose your capital.